If you have been toying with the idea of a bathroom remodel for your home in Roselle, but have just been waiting for the right time, then it is finally here. As a homeowner, one of the best decisions you can make for your home is a bathroom remodel, and there has never been a better time to do it. The team of professionals you hire to perform this remodel is every bit as important, if not more so, that the actual design you decide to go with. You can have the perfect design for your bathroom in mind, but if you have a team of sub par contractors working on it, it could easily turn out to be a nightmare. When you are looking for the best Roselle remodeling contractors the area has to offer, look no further than the professionals at Best Home Renovations, your Remodeling Contractor. 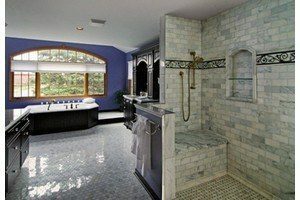 Our team of professionals have been delivering high quality bathroom remodels to all of our customers since 1997 and we have no intention of stopping anytime soon. We have actually been in the business so long, that we are presented with the privilege of giving another update to rooms that we have remodeled years in the past. It gives us a tremendous amount of pride that our quality results have stayed in our customer’s minds so long that they remember to call us back in even years later. Our dedication to quality workmanship and customer satisfaction has always been one of our defining qualities as a company, and it’s one that we will always strive to carry on in the future. especially useful if you are considering selling anytime in the near future. They allow you to take advantage of your entire bathroom space. No more dead space or inaccessible areas in your bathroom design. had a previous owner, as there are probably aspects of it you have never quite liked. The kitchen is one of the most important rooms in your entire home, and definitely sees some of the most traffic. It only makes sense that you would want this important space customized to your exact needs. Whether you are looking for better storage options with new cabinets or would just like to update the countertops and appliances to freshen up the aesthetic, our team of designers can help you find the perfect touches to revitalize and update your kitchen. A professional basement finishing service from the experts at Best Home Renovations can do wonders for the function of your home. The space is already there, so why not turn it into what you need? Whether you are looking for a new play area for the kids, a cool new social area for your family and friends to gather, or a suitable space for an extra guest bedroom for visiting relatives and friends, a professional basement finishing can give you the solutions you need. 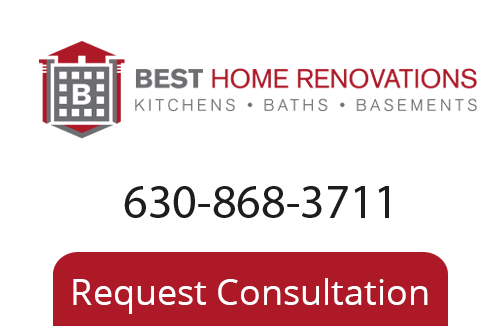 If you are looking for a professional remodeling contractor in Roselle or the surrounding area, give us a call today at 630-868-3711 or fill out our online request form.